Chris Bridgeman was 6 years old when his father, a famous test pilot who had raised the world speed record to 1,431 mph in 1951 and adorned the cover of Time magazine two years later, died in a Pacific Ocean plane crash in 1968, his body never found. Chris' mother, Jacqueline Bridgeman, was forced to somehow console her young son. Nearly 43 years later, Jacqueline finds herself in a strikingly similar situation. But, this time, she's doing so as a grandmother. Last week, her son, Chris, was abruptly taken and his only son, 16-year-old Alex, must cope with the loss. Getting through it will be tougher for Alex, she said. "He just worshipped his father," she said, describing the two as "inseparable." "He's torn apart." Chris, a 49-year-old Ketchum resident, died on Bald Mountain Wednesday, Feb. 9, when he collided with a tree. Details as to how that occurred weren't made available until early this week. Witnesses have shed some light on the accident, but not much. Blaine County Sheriff's Lt. Jay Davis said in an interview that witnesses riding a chairlift saw Bridgeman down on the snow sliding along the Lilly Marlane trail at "high speed" with only one ski. Lilly Marlane is a cat track that starts near the bottom of Flying Squirrel, crosses Undergraduate and ends near the bottom of Lower College, offering access to Baldy's River Run side from Warm Springs. Witnesses saw Bridgeman slide off the cat track and into a tree. Davis said no witnesses have come forward revealing how Bridgeman was knocked down and lost his ski. "We may never know the cause of the accident," he said, adding that Bridgeman died from head trauma. "With nobody around, this is pretty much as far as we can get." His wife, Lucemare Bridgeman, said that Alex, in search of closure, skied with a friend to the spot of his father's death on Saturday. 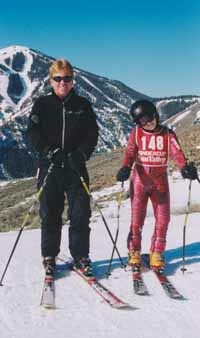 Jacqueline said Chris was an avid skier, starting when he was 5 years old. The family, living in Malibu, Calif., would vacation in Sun Valley. Chris attended the University of Utah and then moved to Portugal, where he met his wife, a native of Brazil. Their son was born there and they soon after moved to Ketchum. Chris was a board member of System Property Development, a company that operates parking lots coast to coast, his mother said. "Chris was on the mountain every day," she said. Alex said his father told him that in the case of his death, he wanted his ashes spread on the mountain. "He told me he wanted to die skiing hard," Alex said, "and he didn't want to be buried. He wanted his ashes spread across Upper Limelight." Lucemare reiterated the same sentiment, claiming Chris told her he didn't want to die sick in bed, writhing in pain. "He said, 'I want to live as long as I can enjoy,'" she said.